The Shepherdstown Red Sox African American baseball team played from 1932 to 1970 against different teams from all around the area, including Martinsburg, Kerneysville W.Va., and Sharpsburg Md. The first uniforms the team wore were red T-shirts with “Red Sox” stitched on the shirt. As the years passed the team would receive new uniforms. These uniforms were white button up shirts with the word “Red” on the right chest plate and “Sox” on the left chest plate. On the back of the shirt was the uniforms number. Along with the uniform the players would wear a ball cap, a white sweatshirt, baseball pants, red socks, and cleats. The other important part of the uniform was the red socks the players wore. The socks have a loop at the bottom and go around the foot and would get pulled up to below the knee. 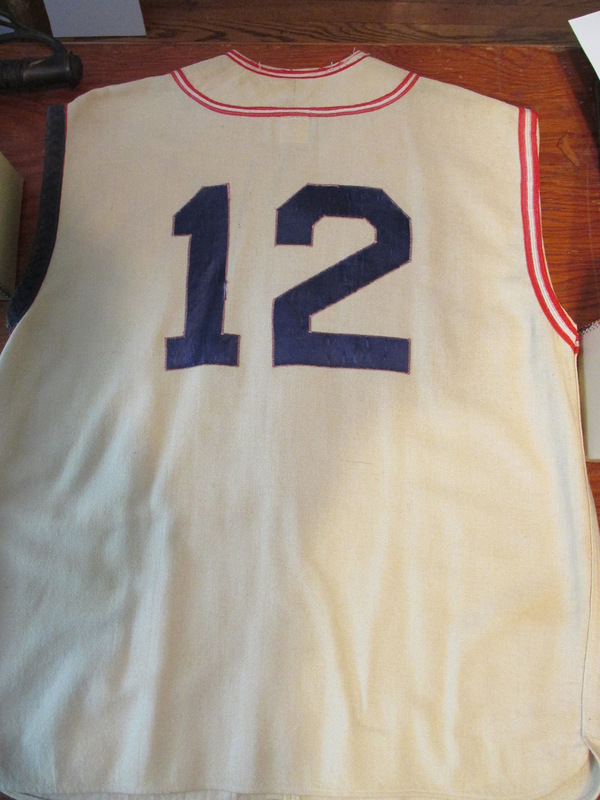 This uniform was worn by the team until they disbanded in 1970. The team was always low on funds to support itself with uniforms and equipment. The team received support from different organizations and businesses in Shepherdstown. Some of these places included Kave’s grocery store, Jefferson Security Bank, and Shepherd College. These businesses and others gave money and equipment to the team for its starting. The college gave the team bats, new and used, and a place to play baseball. When the college was not using Fairfax Field (the college baseball field) the Red Sox were allowed to use the field to practice and play games. The team also used the field at Morgan’s Grove Park and the local high schools field. [i] The field that the team would use for games on Sundays was Fairfax field. The Red Sox played against teams from as far away as Washington D.C. and Baltimore MD. They also played against local teams from Martinsburg, Bakerton, Charles Town, Pikeside, Blairton, and Kearneysville as well as the local prison. The team was filled with “excellent ball players” from around the area. [ii] From playing against these different teams from different areas they continued to receive support from the community. With this support they were able to continue as a baseball team in the greater organization of the Tri-County League. These included Jefferson, Berkley, and Washington counties and they would play against different teams from these areas. This was the beginning of the end for the team. When the team dropped from the Tri-County League in 1970 they stopped playing ball for the most part. The team and its uniforms “were but a fading memory, fading but never to be forgotten.”[iii] The players and their uniforms are still a part of the community and are still remembered as a great Sunday afternoon event for everyone at Fairfax Field.